Neteller’s popularity is due to many factors. One of them is the fact that it lets players fund their account in markets where traditional methods like debit and credit cards may not work. It’s also very convenient because transactions in and out from a casino account are among the fastest in the industry; and often among the cheapest as well. Although payments are only allowed as long as you have enough funds in the account, there are dozens of ways to add money and with an option to apply for Net+ Prepaid Mastercard or Net+ Virtual Prepaid Mastercard, members also enjoy instant access to their cash at millions of point-of-sale, ATM and online locations. All that is authorised by the Financial Conduct Authority in the UK. The majority of online casinos have Paysafe services, including Neteller. Important: Some casinos may offer additional “deposit bonus” if you choose Neteller as a payment method; others may have restrictions that won’t activate a welcome bonus at all. WHICH ONLINE CASINOS ACCEPT Neteller IN 2019? Let’s guide you through the exact process of using Neteller at your preferred online casino, and how you go about creating it if you don’t have one yet. The sign up is free, so go ahead and register by filling in your personal details and choosing an email that will be used as a username or account ID. Additional email addresses can be added and linked to the account at any time. You’ll also need to choose the account currency from more than 20 different options. This cannot be changed later, so choose it carefully to minimise exchange fees! When the account is created, upload funds using one of 60 different worldwide payment methods, including Bitcoin (fees apply). Tip: you can also use Skrill to transfer money over to your Neteller account. Although the service is available for use right away, you may want to consider going through the KYC verification to lift payment limits from restrictions that apply by default. It’s also advised that you turn to the Two Step Authentication for additional peace of mind. Unfortunately, you can’t pay through Neteller if you don’t have any money on the actual account (unlike PayPal). 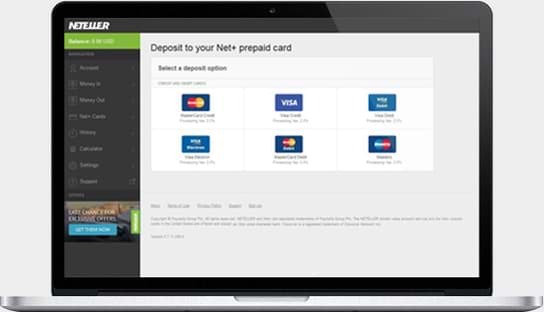 If you have a Neteller account then making your first deposit with this online payment method is simple. Having created a casino account at a site that accepts this banking option, go to the cashier and choose the option from the menu. Mind the minimum and maximum deposit limits and proceed to enter your email address (user ID) and password on encrypted servers to finalise your payment. You may also be asked to enter your Secure ID, which you received upon registration. The money should hit your casino balance in just a matter of minutes or seconds. Neteller is also a popular means for making casino withdrawals thanks to the faster cashout times compared to traditional methods like credit/debit card or bank transfer. All you have to do to withdraw money back onto Neteller’s account is choose this method from the payout options and enter the same minimal details as for deposit. Some casinos may charge additional processing fees, but in many cases this is one of the cost-effective payment gateways from a player’s standpoint. Mind the bank transfer fees when withdrawing funds from Neteller (see Skrill instead). If it’s not your first withdrawal and it’s within operator’s thresholds then chances are it’ll be processed instantly just like deposits. Yes, as long as you also use it to make deposits. keyboard_tab How much can I deposit? The minimum and maximum amounts for this type of method (e-wallet) is very flexible and is usually between 10-2,000 euro or equivalent in other currency. keyboard_tab What if my currency is not supported by the casino? If the currency at the casino and Neteller don’t match then the payment is still possible, but you’d have to pay an exchange rate as can be found on the list of fees. keyboard_tab Is it safe to use Neteller? Paysafe Financial Services Limited, the parent company, is a wholly-owned subsidiary of Paysafe Group Limited which is authorised by the Financial Conduct Authority under the Electronic Money Regulations 2011 (900015). Neteller is used by thousands of casino players worldwide because it’s more private, inexpensive and faster when compared to traditional payment methods. At the end of the day, players just want to get over with it and get on with the fun, which is something that Neteller seems to understand and enable quite well.